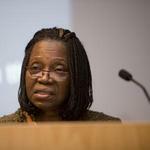 The 2007 Lancet Lecture was given on Friday 9 November by Professor Adenike Grange, Minister of Health for Nigeria, in the UCL Cruciform Lecture Theatre 1. Speaking about the work being undertaken by the Nigerian government, Professor Grange said: "There is enough in terms of knowledge initiatives, strategies, tools, drugs and treatment protocols to cure disease and prolong life, but the reality is that the systems designed to bring about these outcomes are inadequate at best or even non-existent. This is a global problem." Nigeria ranks second in the world for the worst health indices, a situation that has sharpened its need to address some of the issues impeding access to quality health services, such as infrastructure, unfair distribution of resources and high cost of poor services. Professor Grange described the work underway to develop a National Health Investment Plan (NHIP), which will address the key priorities for Nigerian healthcare and involve communities and healthcare workers in its design. It is hoped that this will help to standardise approaches to health delivery in Nigeria and emulate best practice from other countries. Other priorities for Professor Grange will be working to eradicate polio, control malaria, reduce maternal mortality, and reduce levels of disease, particularly in the most vulnerable groups. UCL is involved in a number of health projects in Nigeria, including a cervical screening programme established by the UCL Institute for Women's Health. Cervical cancer is a common problem in Nigeria, whilst screening programmes in many western countries have vastly reduced the incidence of the disease. Introducing these simple and cost-effective cervical screening programmes in Nigeria can save many lives. This project in Lagos and a similar one in Kampala, Uganda, have already successfully screened thousands of women and aim to screen thousands more. To find out more about UCL's work regarding global health, follow the link at the top of this article. Please Note: This is a pilot service. The video is encoded in Flash. If you are having problems viewing the video, then it is likely that you need to install the latest version of the player. Click on this link to download. For further issues or comments, please email web-support@ucl.ac.uk.